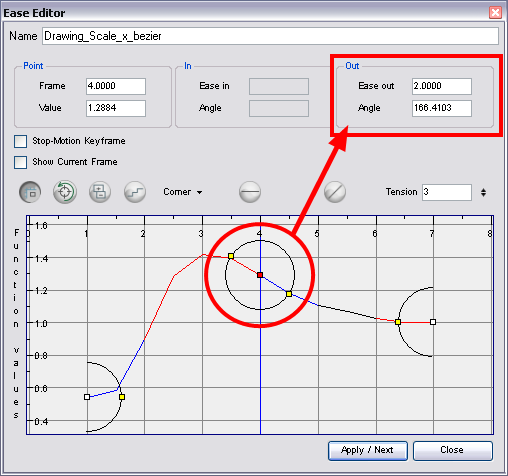 You can reshape the velocity function using Ease controls. 1. Click on the keyframe to select it. 2. To set the number of frames in the ease-in, press [Alt], click to the right of the keyframe and drag the green line. The ease in slope is indicated in blue. As you change the values visually, the value in the Ease In field is updated. This value represents the number of frames in the ease-in. 3. To set the number of frames in the ease-out, press [Alt], click to the left of the keyframe and drag the green line. The ease out slope is indicated in red. As you change the values visually, the value in the Ease Out field is updated. This value represents the number of frames in the ease-out. 4. To adjust the ease-in or ease-out, drag the handles around the keyframe. ‣ Straight: allows you to move the handles together, maintaining the same angle to the point. ‣ Corner: allows you to move the handles independently.